Original artists and videos from iconic 80s tracks, including 21 worldwide No.1 hits! Get into the groove with We Sing 80’s and sing along to the biggest songs from one of music’s best-loved decades! Featuring era-defining artists and a host of fantastic multiplayer features, We Sing 80s will have you singing the same songs that you sang into your hairbrush all over again, but this time to the real music/artists and videos! 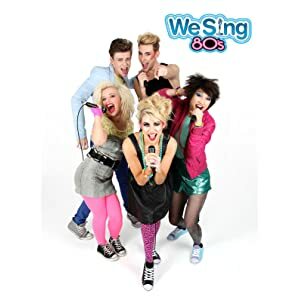 Get into the groove with We Sing 80s and sing along to the biggest songs from one of music’s best-loved decades! Featuring era-defining artists and a host of fantastic multiplayer features, We Sing 80s will have you singing into your hairbrush all over again. 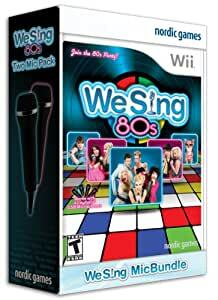 Coming soon from the best-loved We Sing range, exclusively on Wii. Iconic 80s tracks, including 21 worldwide No.1 hits! 21. Cameo - Word Up! Culture Club: Do You Really Want to Hurt Me? My husband and I LOVED this game. The songs are mostly well known, the videos they display while the song is playing are the actual, original videos (and they're hysterical), and it's very user friendly. If you love to karaoke, this is definitely recommended. We have the Pop version as well, but prefer the 80's. Being a 80s kid this was a must have for and 80 gathering we had with some of my old school mates. But now my daughter and her friends love this game for the Wii. Lots of fun and great with the two mics. 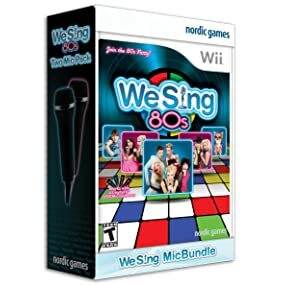 Almost perfect, but censoring videos of the songs was terrible, I bought this game for the Sabrina's song Boys Boys Boys, because i love the video and the song, but unfortunately, there's no video of the song, awful, instead Nordic Games maybe add some feature to restricted the video to minors, but as an adult you can view the videos. My husband and I were disappointed in the selection on this. We read the description, but I guess we were hoping it had a little more and had just been abbreviated for advertising purposes. Unfortunately, what it says all you get. In the end, we were left wanting more from it than we got!